Handling Level-Of-Detail (LOD) gracefully for terrain turns out to be tougher than you might expect. Terrain has a particular characteristic that you don't usually have to deal with when doing LOD for other kinds of objects (ie: trees, etc.) - it is continuous. That creates problems. 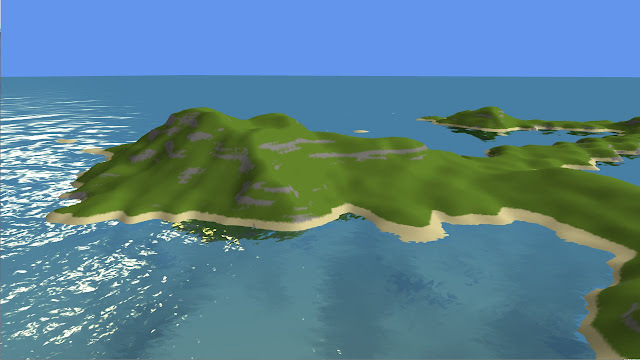 Initially, I was doing LOD on an entire island-by-island basis. 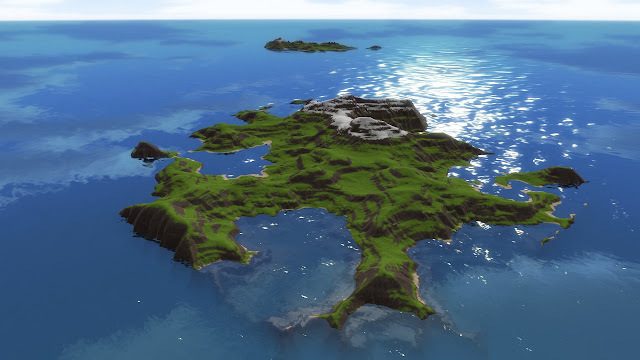 I could increase or decrease the detail of the island based on distance, but the entire island had the same level of detail. That worked ok, but it was inefficient and I knew I would eventually outgrow it. 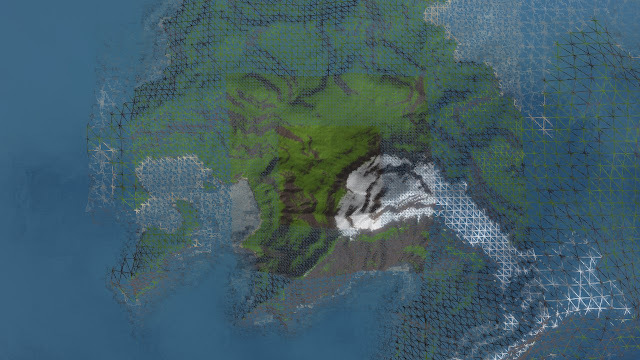 Above, you can see my current method for doing terrain LOD. 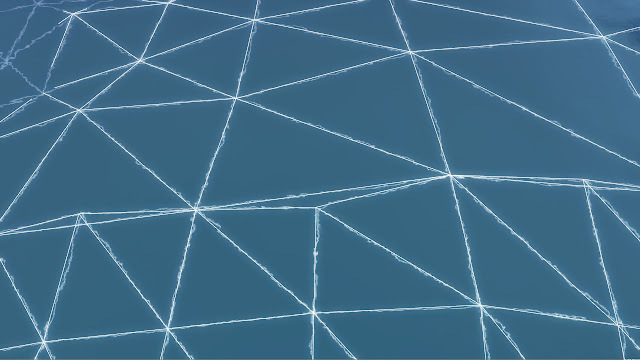 Instead of the terrain being composed of a single grid mesh, it is now broken down into concentric square "rings". With each successive ring, the grid size is doubled. As the camera moves, the grid moves with it so that the highly detailed area is always nearby. It took me a while before I came up with a solution to the seam problem that I was happy with. Most techniques for handling seams revolve around adding extra geometry to "stitch" the edges together. I really didn't want to resort to that unless I had to. Conceptually, my solution was to force the heights of the extra middle points on the edge of the more detailed grid to be the average of the two points on either side - essentially simulating the edges of the neighboring, less detailed grid. In practice, though, it is a bit more tricky. I couldn't do the averaging in the terrain shader since it only has very local access to one vertex at a time. Since my height data is passed to the shader in a texture (rather than being baked into the vertices themselves), I was able to create a secondary texture at each level of detail where I pre-set the averaged intermediate points. Then I configured my grid vertex data with an extra piece of data (currently in the otherwise unused 'Z' component of position) - a blend amount between the averaged height texture and the unmodified texture. Edge vertices have this set to 1, while it is zero elsewhere. 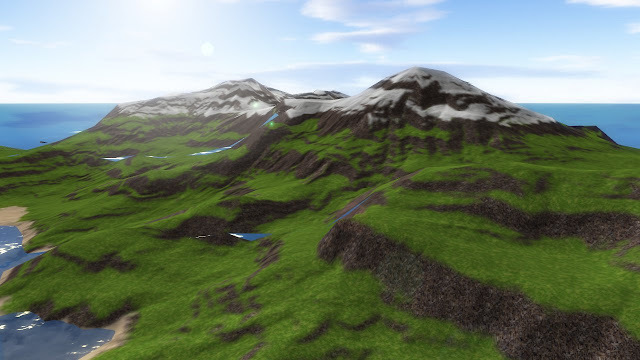 It isn't Crysis or Just Cause 2 yet, but my terrain rendering system is coming along nicely. Here is a flyover video. Any stuttering in the video is from the capture and encoding process - it runs butter-smooth. Skybox rendered with Terragen and cube-maped with AMD CupeMapGen. Texture splatting for landscape detailing. Water shading based on a modified version of Kyle Hayward's water component with the addition of variable water transparency depending on water depth. Bloom and Lens Flare based on Microsoft's XNA samples. Simple terrain Level-Of-Detail system. It currently works at a whole-island level - I'll likely have to move to a more complicated approach. I just finished adding a skybox to my scene (rendered with Terragen, put into a cubemap texture with AMD CupeMapGen). The water looks much more interesting when it has something to reflect. 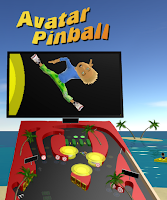 With Avatar Pinball now in peer review, it was time to move on to a new project. 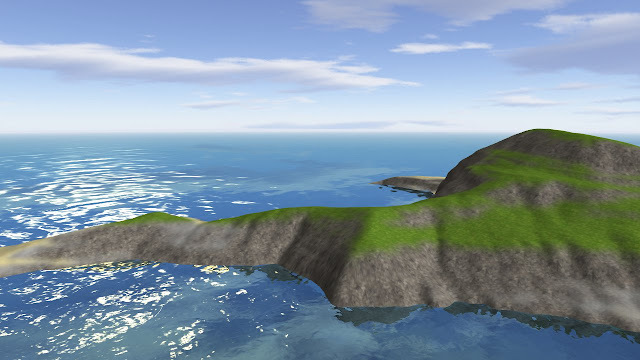 Since the backdrop for my next game is a set of islands, I needed to create a terrain rendering system. I've only been working on it for a couple of days, but as you can see above, I've already managed to get pretty far. I'm using similar techniques to those I described a few years ago when I was working with TV3D. In this case, however, I'm using my own shader to do the texture splatting. The water is done using a modified version of Kyle Hayward's water component for XNA.